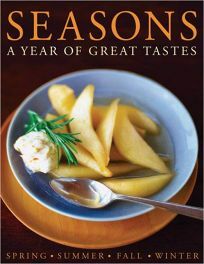 This beautifully photographed cookbook emphasizes fresh, seasonal cooking, separating recipes into chapters dedicated to the bounty of spring, summer, fall and winter. Spring's recipes include a deliciously creamy Asparagus Risotto and a decadent Buttery Roast Lamb with New Potatoes which requires almost no preparation time but tastes like it emerged from a restaurant kitchen. Summer is represented with such happy treats as Gazpacho, Crab Cake Salad and Orange-Flower Panna Cotta. Fall and winter's recipes are predictably heavier, but no less appealing; tasty offerings like Venison Daube and Honey-Roasted Ham call to mind changing leaves, dropping temperatures and heartier appetites. The editors of this volume pay attention to vegetarian cooking - every chapter offers tempting meatless options - and write in the sort of clear, careful prose that makes even complicated recipes seem effortless. Finally, there's a wide selection of international recipes: Moussaka is a Greek spring treat, while Italy welcomes fall with Crepes Al Funghi. But, really, recipes this enticing deserve to be savored all year round.